Tidal Energy is another type of renewable energy resource that utilises large amounts of energy within the oceans tides to generate electricity. As we all know from our science lessons, tides are caused by the gravitational forces pulling upon the Earth by both the sun and the moon. As both the sun and moon’s elliptical orbits vary around our planet, the gravitational forces of the two cause our seas and oceans to rise and fall in a continuous and predictable manner. The result is that vast quantities of water are constantly circulating around the Earth from one end to the other under the control of the sun and the moon. The result of all this oceanic movement is that coastal areas have two high tides and two low tides within slightly more than a 24 hours cycle. So one high tide is on the longitude nearest to the moon while the other is on the longitude furthest from the moon. The earliest known exploitation of tidal energy was used may hundreds of years ago by tidal mills, which were created by building a low walled barrage type dam across the mouth of a river estuary. Hence its name Tidal Barrage. Sea water is trapped in a tidal basin on the higher rising tide and released back into the seas at low tide through a low-head waterwheel, providing power for everything from turning a stone mill to grind corn, sawing lumber to operating the bellows and hammers in ironworks etc. The difference in vertical height between the highest tide and the lowest tide is called the “tidal range”. Today, the rising incoming and falling outgoing tides are used to generate electricity, in much the same manner as hydroelectric power plants. In fact the technology required to convert the tides potential energy into electricity is very similar to the technology used for traditional hydroelectric power. Generally, tidal barrages for electricity generation use large low-head turbines which can operate for a greater fraction of the day. But building dams and fences across tidal estuaries is an expensive process, therefore the best tidal sites are those that exist where a tidal bay has a narrower opening, thus reducing the length of the dam required. Electricity is generated by the force of the sea water flowing both into and out of a tidal bay through a water turbine, turning an electric generator to produce electricity. Because there are two high and two low tides each day, electrical generation from tidal power plants can be predicted years in advance, unlike wind energy, and is characterized by periods of maximum generation every twelve hours, with no electricity generation at the six-hour mark in between the high tides. Another tidal energy design that uses the currents created by the ebb and flow of the tides is called Tidal Stream Generation. Tidal stream generation is very similar in principle to wind power generation except this time water currents flow across a turbines rotor blades which rotates the submerged turbine, much like how wind currents turn the blades for wind power turbines. 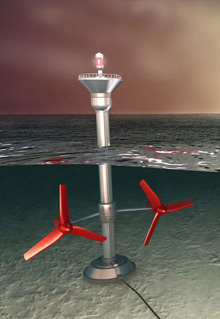 In fact, tidal stream generation areas on the sea bed can look just like underwater wind farms and in areas where the coastal currents are strong, a suitable tidal stream turbine can generate as much free tidal energy as a wind turbine at the same speed and almost four times the size. Tidal energy has many advantages compared to other forms of renewable energy with its main advantage being that it is completely predictable, which means power generation is predictable too, unlike wind or solar energy. Another advantage is that the tidal turbines are located out of site underwater, and therefore produce no harmful emissions or noise. However, like many other forms of renewable energy, tidal energy also has its disadvantages such as its inflexible generation times dependent upon the tides and the fact that it operates in the hostile conditions of the open oceans and seas which can be a stormy and violent environment, resulting in the tidal turbines being destroyed by the very energy they were designed to capture. Tidal energy is a renewable source of electricity that does not result in the emission of gases responsible for global warming or acid rain, which are associated with fossil fuel-generated electricity. Use of tidal energy could also decrease the need for nuclear power. Changing tidal flows by damming a bay or an estuary or locating large turbine generators onto the seabed could, however, result in negative impacts on aquatic and shoreline ecosystems, as well as on navigation and recreation. Tidal energy from the sea requires a large capital investment in dams, turbines and support ships, but once a “tidal energy” plant is built the energy it generates is essentially free with the system being relatively inexpensive to run. For more information about “Tidal Energy” and how to generate your own electricity using the power of the sea. Or to obtain more tidal energy information about the various types of tidal energy systems available, or to just explore the advantages and disadvantages of tidal power as a renewable energy resource, then Click Here to order your copy from Amazon today about ocean, tidal and wave energy, the energy revolution from the sea. Tidal energy is most often produced in large amounts using a tidal barrage, similar to a dam. When built across a river estuary, the tide flows through this barrage and either spins a turbine directly, or compresses air through a pipe, which is in turn used to spin a turbine. Barrages rely on gravitational potential energy: a high tide will fall to a low tide. However, this method of energy production comes with several drawbacks: there are only around twenty sites globally that are suited to a barrage; and they are known to block the passage of sewage or other sediment, as well as fish and other marine life. There have been recent developments to the tidal barrage—for one, the tidal lagoon, which is similar to a barrage except it is not built fully across the river estuary. There is also the tidal stream generator, essentially a wind turbine that is not pushed by air but by the flow of a current. However, both the tidal lagoon and tidal stream generator are not yet fully developed, so they are not used in more than an experimental capacity. Why is tidal energy not promoted more and more widely used? Lack of interest or lack of funds? Or the result of the lobby of the oil industry? Is tidal energy an alternative or are there too many obstacles?